Tip #1: Don’t simply take the word of the dealership- find out what others have to say about their experience in buying an RV. You can learn a lot from someone else’s past experience by reading testimonials and reviews left online by other customers. If you have a preferred local directory that you use for reviews, such as Yelp, or Angie’s List, make that your first stop online, and if you don’t already have one saved as your preference, a quick search on Google can get you familiar with several. Unbiased reviews left on trusted local directories can help you choose the right RV dealer in Blue Springs. Consider Liberty RV in your quest for affordable, quality RVs, campers, and travel vehicles. Tip #2: Take advantage of online resources, including the dealer’s own website. Create a short list of RV dealers in your area and visit each of their websites to see what’s available. At Liberty RV, you can search their entire inventory from the comfort of your own home, including new and used RVs and travel trailers. Apply for financing for your new RV right over the Liberty RV website and secure financing before you even start shopping! Financing through an RV lending specialist on the Liberty RV website can ensure your down payments fit your budget, with 15 and 20 year repayment schedules to assist you in owning the RV you’ve been dreaming of! Tip #3: Ask around your community for a personal referral for an RV dealer in Blue Springs. If you have a friend or family member who owns an RV or travel vehicle, find out where they shopped. Once you start looking, you’ll be amazed at how many people you know who own an RV. Listening to positive and negative stories can help you make the best decision regarding your upcoming purchase. Tip #4: Call a sales specialist. There’s really no better way to find out more about a dealership than by speaking directly with someone from their team. You can call Liberty RV at 816-415-CAMP to discuss your plans in owning a new RV. Once a sales agent has a better understanding of what you’re looking for and what kind of budget you’re working with, they can make personal recommendations out of their inventory. 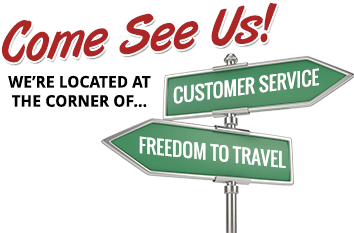 Feel free to contact Liberty RV by phone or over the website. No other RV dealer in Blue Springs is as committed in helping you find exactly what you want at the price point you can afford. Call now to discuss travel trailers, fifth wheels, hybrid campers, toy haulers, folding campers or another pleasure vehicle.